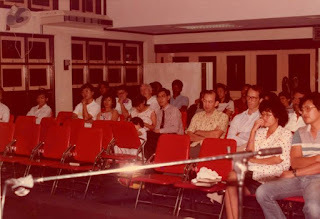 After joining the Church in Australia in July 1979, I first came back to Kuala Lumpur in February 1980 to explain to my parents about my membership in the 'Mormon Church' especially about the personal revelation I had received to be a full-time missionary while in Australia. 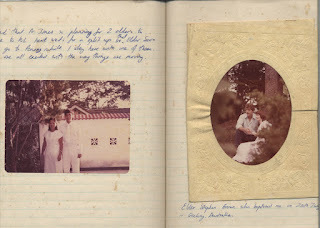 I've kept my journals well so the part on my personal revelation is found in this post while my experience to face my family at home is found in this other post. 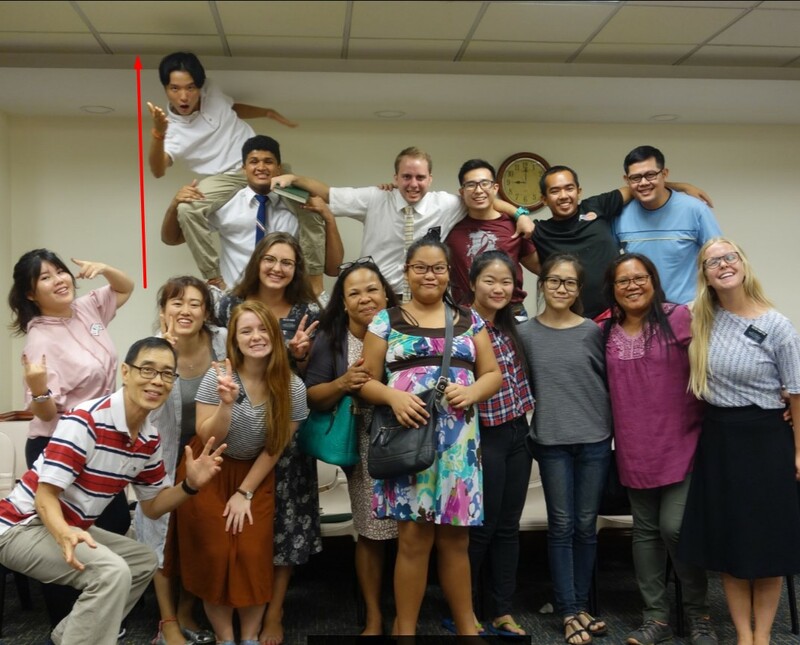 Everything turned out well and I completed my full-time mission to serve in the Singapore Mission, primarily in West Malaysia where I had spent most of my time. 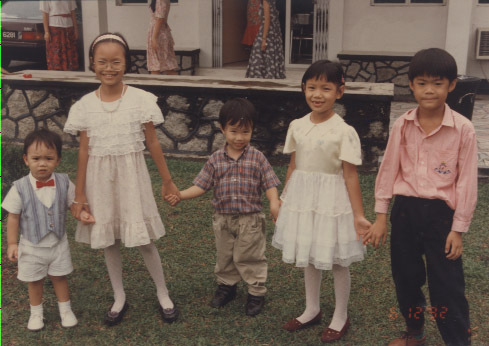 I got married soon after my mission to a wonderful Singapore girl and we raised 6 children together living in Kuala Lumpur. I became the family historian due to my regular family journal posts of stories with photos and videos that could eventually be digitized. 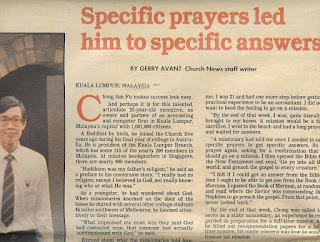 Somehow, due to my length of stay and activity in the Church in Malaysia, I became a sort of Church historian too, probably due to my professional discipline as an accountant to maintain accurate historical financial records or documents! Another reason could be that I have two very close and old friends who were pioneers of the Church in Malaysia. One is Anthony LimTeong Keat who was baptized on 3 Dec 1972 in Kuala Lumpur and still living in the same city so I have frequent contact with him who has kept good records for the Church since the early days. The other is Thee See Ba who was baptized on 26 July 1971 up north in Penang and now lives in Hawaii where I would either meet him there when I visit or when he flies home to Malaysia for holidays. 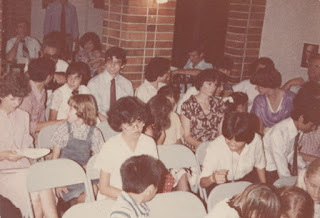 With Facebook today and emails, connecting with my old friends from the Church is an easy task that makes the work of collecting historical information so much easier. There are many other old friends I maintain throughout the world and those that have provided me with old photos or printed information, I would acknowledge them when I use them in my own journals. 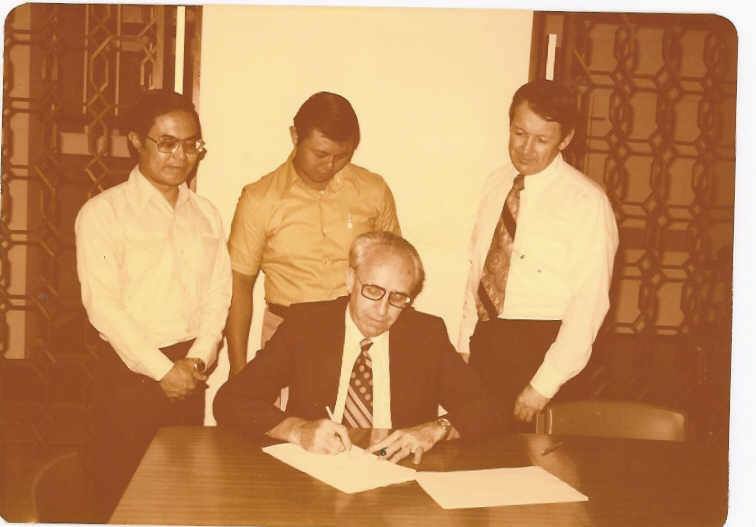 The signing of the incorporation documents of the Church on 2 September 1977 with Anthony Lim Teong Keat and Rodney How Boon Lok as local Malaysian directors. 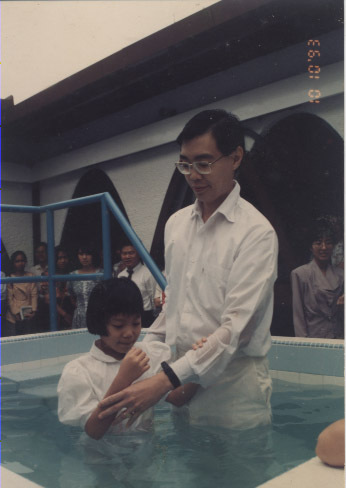 My manual journals recorded our first baptism of Patricia Cheah on Sat 25 Oct 1980. On the right is a wedding card/ announcement I had received from Elder Brown who first taught me the Gospel and baptized me. 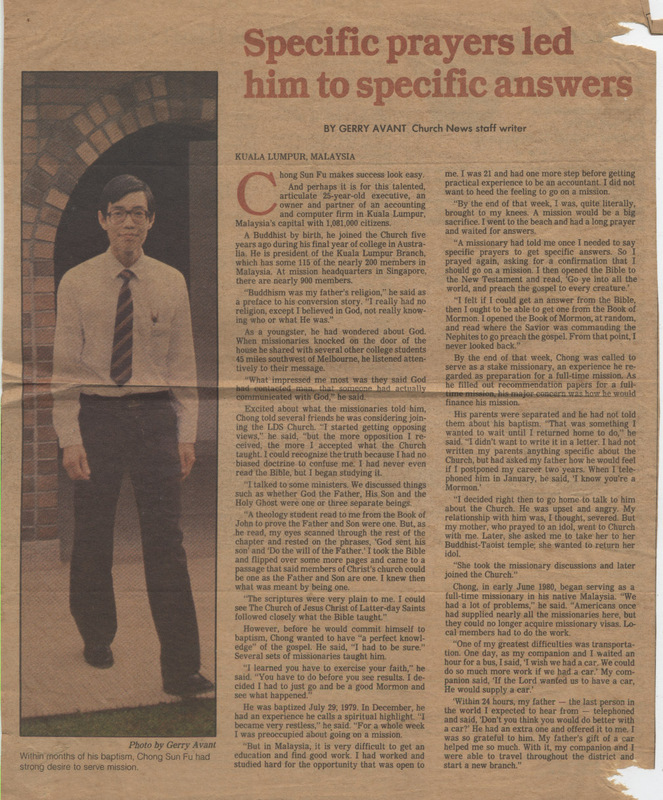 She had later referred to her nephew Michael Lee Chee Cheong who was also baptized mentioned below. Christmas 1981 at the PJ meeting house with the entire missionary force of the Church in Malaysia gathered for the celebration. 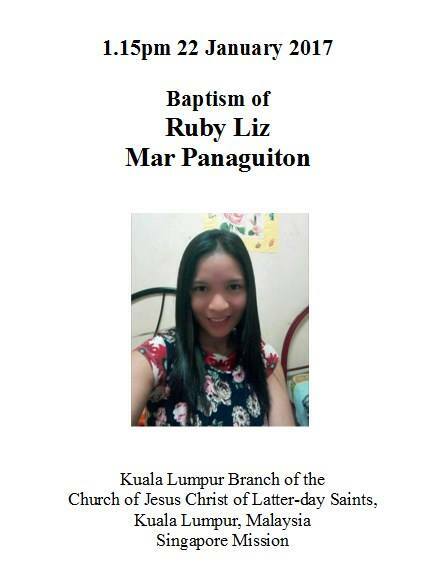 Many baptisms continued during my mission. 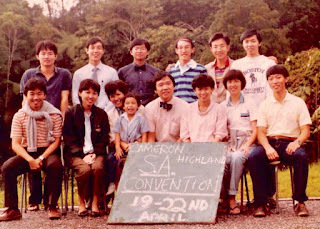 Above is one held on 27 Feb 1982 towards the end of my missionary service that started on 6 Aug 1980 The new converts from left to right are Wong Yut Weng, Jack Yeong, and Michael Lee. 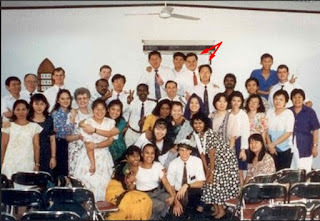 As I had returned home to start my own family in Kuala Lumpur, I could still meet and keep in touch with Michael Lee(above pic) and Wong Yut Weng from the baptism pic above as well as others I had taught or baptize during my missionary service. Jack Yeong had migrated to Singapore to be with the air force and his older brother Marcus Yeong to the UK. Michael Lee with Anthony Seow early in the morning . 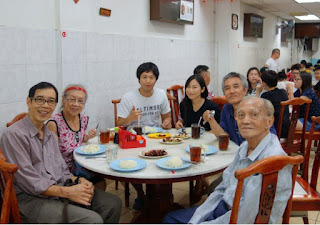 Michael arranged a lunch get-together on Sat 6 April with his father on his left and his Aunt Patricia Cheah on my left. 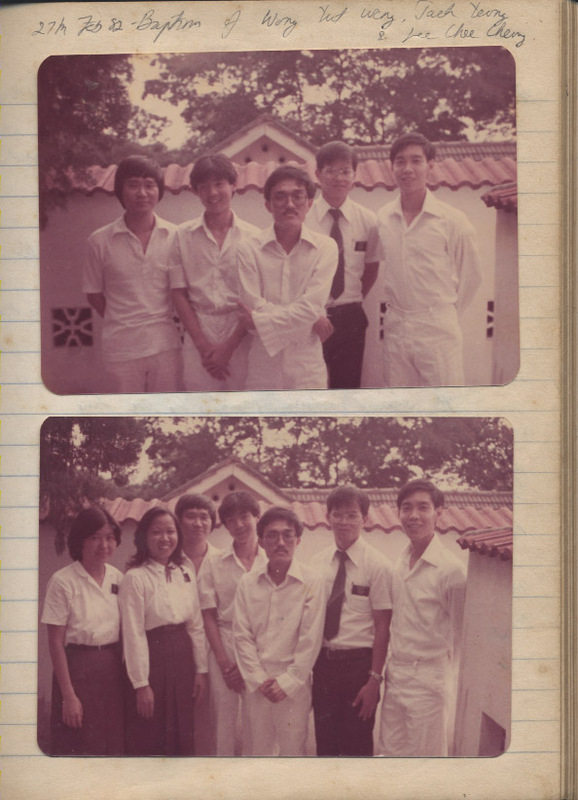 Wong Yut Weng is seen many years since 1982 when he was baptized as a single member to progress in the Church to raise a fine family who made a visit to our Church temple in Hong Kong. 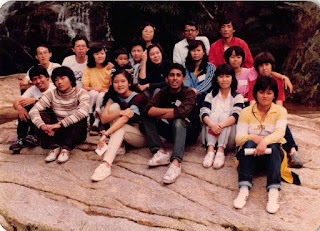 This photo is shared in my special Facebook page promoting Family History and Relationships found here. The photos of the Single Adults convention were obtained from my former missionary companion named Paul Sng who started a closed Facebook group for old Singapore Mission photos found here. 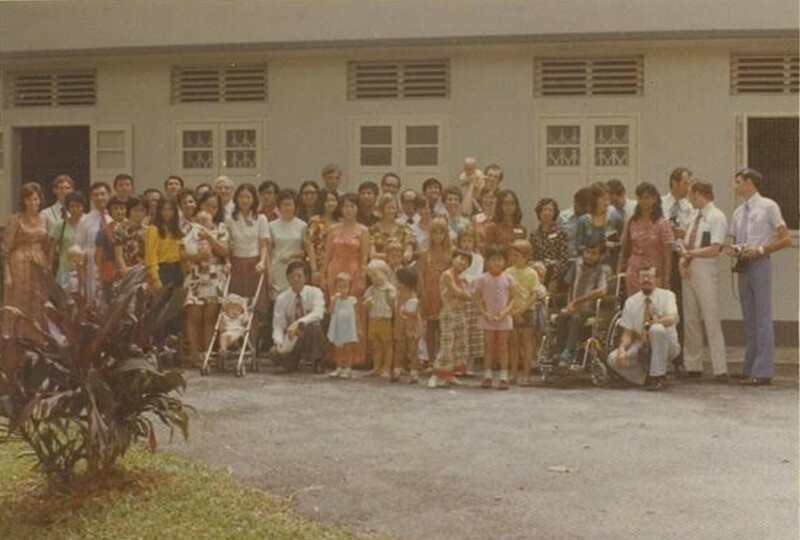 One can apply to join as a member to access the old photos related to the Church in Singapore. 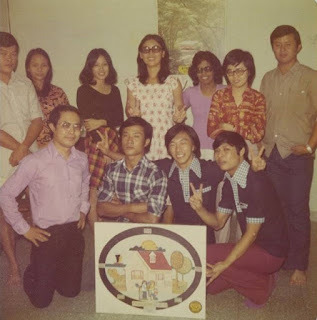 On 30 July 1990, the Kuala Lumpur branch was divided into Petaling Jaya Branch to remain at the PJ meeting house at 3 Jalan Mentri Utara 7/4, Petaling Jaya while the Kuala Lumpur branch would rent a property in KL city. A single storey detached house was found opposite Ampang Park Shopping Mall and the members in the new KL branch boundary soon moved into the building to hold it's regular church services. 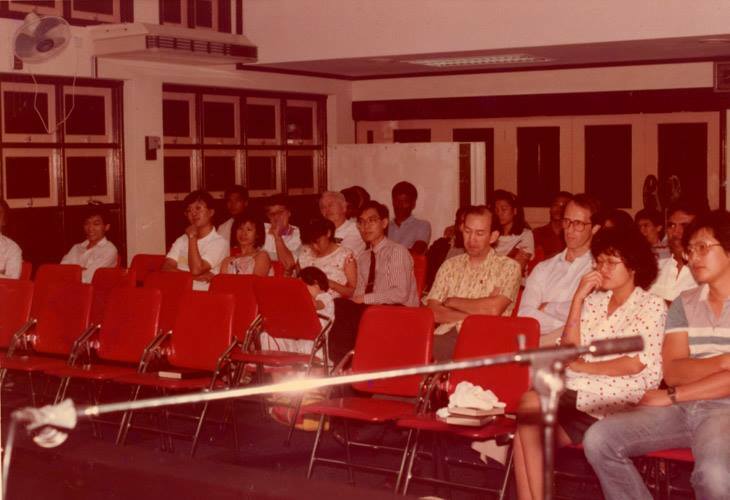 This is the new KL meeting house for KL branch acquired in 1992. My wife actually noticed the 'For Sale' sign for this property while driving past it every day when taking the kids to school. I checked it out to find it suitable and recommended it to the Church Area Office in Hong Kong overseeing properties in the region who approved and proceeded with the purchase process. Our KL meeting house off Jln Ampang Hilir seen in 1992 (Photo shown above is a courtesy of Paul Oman from the US) Not much renovation was required to use the property for our services and classes. 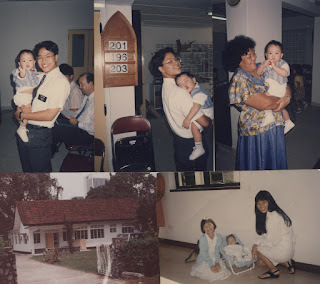 There was a courtyard in the center of the property so a baptism font was built to facilitate baptisms as shown in the above photo where my 2nd daughter was baptized on 10 Oct 1993. 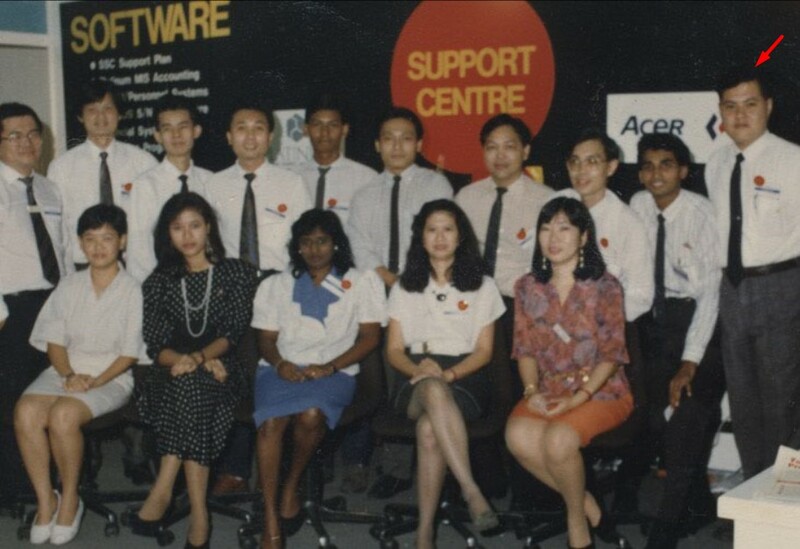 In 1999 our family adopted the 'Von Trapp' family stage name and did our first large family performance in the same KL branch building. 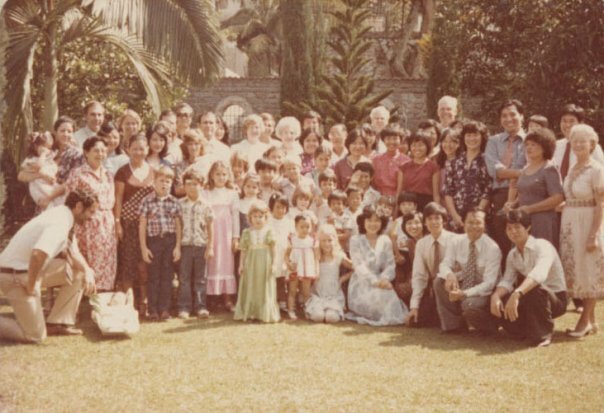 As our family had grown, so did the total number of members too as missionary work had been consistent. 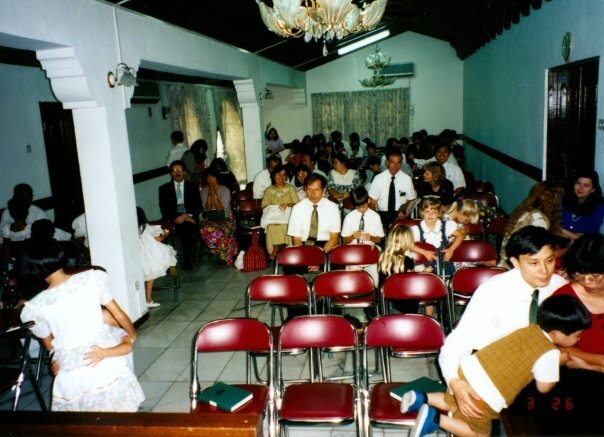 A major renovation was done in 2004 to create a larger hall for the main sacrament meeting usage and more classrooms were created by covering up the open center courtyard where the baptism font used to be. Temporarily the branch had to rent space from a hotel building nearby opposite Ampark Park too near the old house we had rented. I am still in touch with some of the missionaries who served in KL at that time from Utah, Elder Keith Walker and Elder Travis Snow whose names are found on this list of returned missionaries who have served in Malaysia from overseas found in this Facebook group which contains some history of the Church in Malaysia too in the documents section of the group page. We moved back to the renovated house with new facilities as seen in the video below that I regarded as our Christmas gift in 2004! 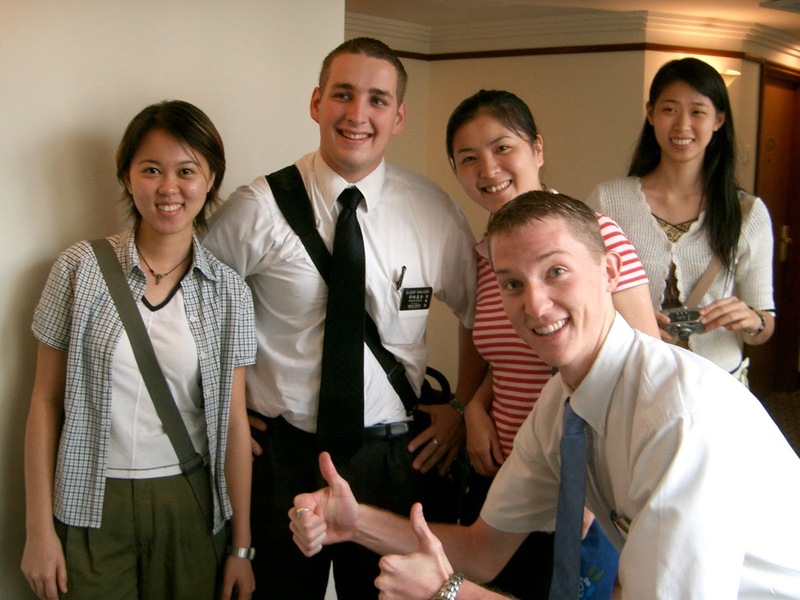 On 2006 January where in the photo are 4 young men who would eventually serve 2 year full-time missions when they are much older. 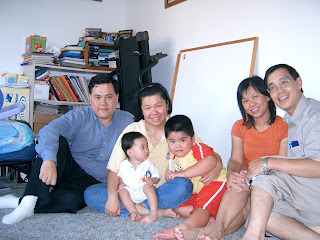 2006 April month when we had visitors from Church in our KL home. In 2007, a strategic decision was made by my wife and me that the best cancer care after she was diagnosed with breast cancer in 2006 was to have her be under the care of an Oncologist of the National Cancer Institute of Singapore. He was recommended by my good Malaysian classmate who studied medicine in Singapore and is practicing in KL today. So we had to move the base of the family to the city my wife was born in. Jan 1, 2007 was our last family photo taken together before the family moved to Singapore. In the previous December month of 2006, a new 'Never Ending Christmas' story began that would be converted to a video, all of which can be read and viewed in this Journal Post. In the month of May 2011, I caught a photo with Steven Tettey from Ghana with his wife and two daughters. I was shuttling between KL and Singapore while she fought cancer for 7 years. 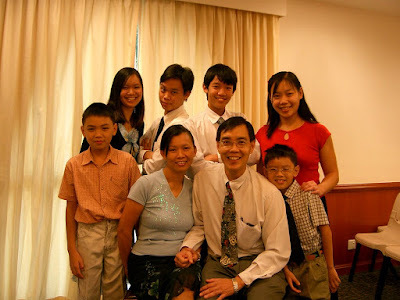 Times flies and when the two youngest became more independent, I could return to my KL branch to settle more permanently and accept a calling to serve as the Branch Mission Leader. 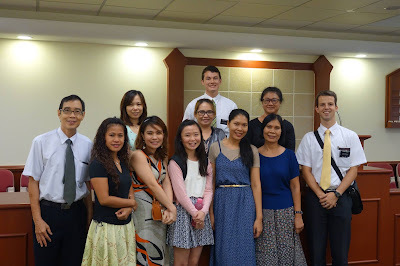 2016 KL meeting house with a photo after a baptism service on 28 August of the year. One can see that from the year 2016 onwards, my journals will incorporate more facebook posts like the ones below in my journals. The reason is Facebook is a media where I can easily and quickly share photos and captions to share my thoughts. It came to my mind that this would save me more time in trying to compose a well-written blog every time I start a new blog post. Why the change? First Thing First, through some defining moments of my life earlier in the year, shared here, I began to prioritize how I am spending my time for the rest of the year. In my desire to do more for the community, I started to establish my new social media business and to complete my first book to publish it as early as I can, targeted in 2018. I have to also quicken my journal recording process so I decided on a new strategy to embed my facebook posts into my blogger posts. So I would from now onwards embed my selected facebook posts that reflect the thoughts of my intended blog post such as this one, so that it will save me time from crafting more words or add photos again to share my thoughts. Doing this also helps me index my facebook posts for easier reference in my better-organized blogs of Familylane, Fastlane and Spiritlane. Searching is slow in Facebook as it has daily posts and even by the minute of each day so picking relevant posts from Facebook to include it in a relevant post in my blog post helps me organize or manage my historical records or thoughts better for faster search in the future. The most important thing, of course, any time-saving method will free more time for me to work on priorities I have yet to achieve for the year! This is an application of Covey's Seven Habit's principle of First Thing First' and 'Begin with the End in Mind'. Click the white and blue "f" icon of Facebook to view the video and click the speaker icon to hear the sound. Young man Steven told me he came back in this very short trip, feeling inspired to visit a few people whom he felt wanted to see personally for being a part of his life growing up in the Church. 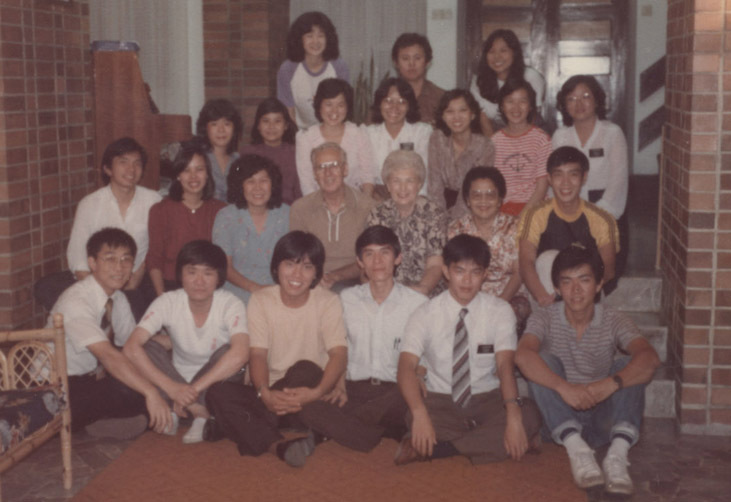 One of them was Elder Freddie Chan, a dear friend of mine from the pioneer days of the Church in Malaysia where we had served together to build the kingdom of God on Earth in the country we loved and served. 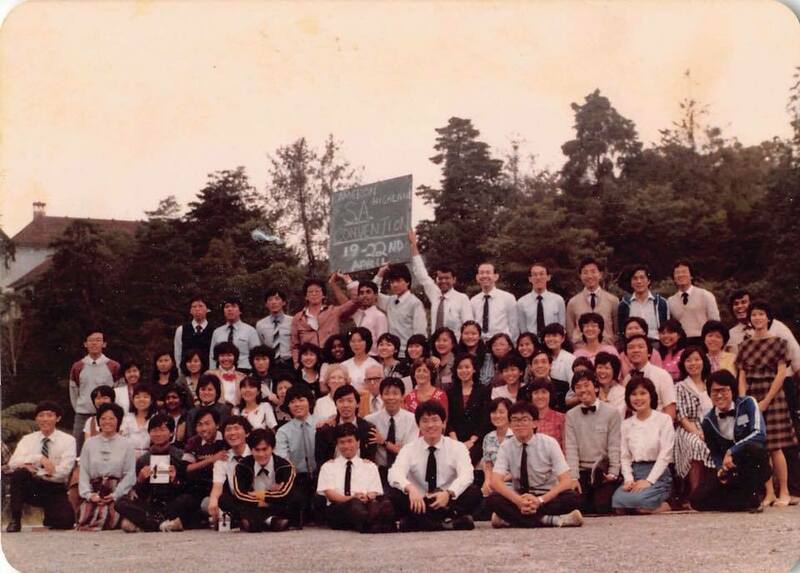 I started this post very much earlier, inspired by the missionary spirit in Kuala Lumpur where I was called home to serve in 1980. Being my busy usual self, a turn of events made me hurry to complete this post and move on to the next one! It is very early at dawn in Singapore where I am now of Saturday 22 October 2016 of the Lord. 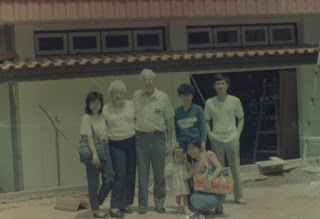 I woke up to shower and quickly finish this post with the spirit of Steven Kok who though felt touched by our spirit in his youth has touched mine more than he realizes in his visit and the recent turn of events that would be covered in the next post. I first got to know his brother Sebastian Kok earlier who worked with me for many years after serving his mission for the Church in the years 1988-90 under President Houghton in Penang, Ipoh, PJ and Singapore as per the information on this list. 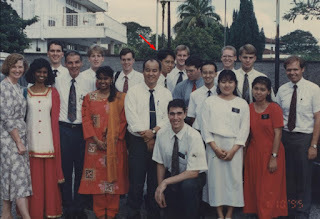 This is another pic of him, pointed by the red arrow, in the year 1995 also seen with many full-time missionaries serving in Malaysia, most likely before he himself would be sent to serve 2 years in the Hong Kong mission in 1995-97. I didn't get to see him again for many years as I believe Steven first moved to live with his in-laws in Texas which was more to the center of US, further away from the west coast where I frequent. 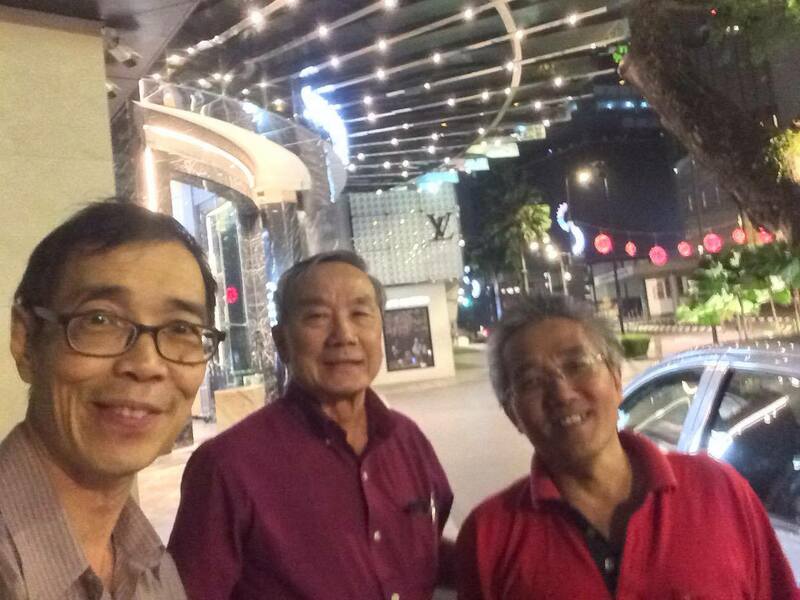 He later came closer to live in Phoenix Arizona where I could squeeze a time to meet him at the airport in my transit at Phoenix en route on a business trip to Seattle last year in Aug 2015 and was nice of him to come back 'home' in Aug 2016 to find all of us oldies in KL! He wanted to meet Elder Freddie Chan and one morning was planned for us to go together to meet Elder Chan but he was not feeling well for visitors after we had called his son Brian. Steven went later on another day by himself. 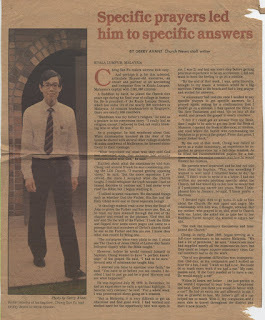 I will now move on to start the next post before I do my spiritual morning run around the nearby running tracks, in respect of Elder Freddie Chan for his dedicated service to the Church from beginning to the end as we received news that he passed away on the night of 19 October 2016. I cannot be at his funeral today as I am in Singapore with family until Nov 3, to celebrate 2 birthdays of my sons here and attend other business meetings! 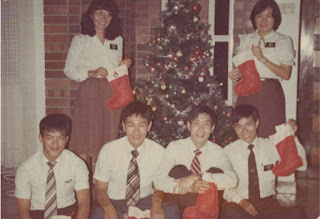 The post will include some coincidental communication from Steven to me on the day of my oldest son's birthday and then be receiving the news of Elder Chan's passing on the same day in the evening! The facebook post below shares announcement of my Community Service First initiative. The reader can read contents of the caption of the photo which will be my summarized thoughts at that time. For more photos and captions sharing more thoughts, one just has to click the comments icon below the facebook post to view more pics and comments I have added to further elaborate on the main theme of my facebook post. Click on the comments icon above to read my further comments with more photos added. 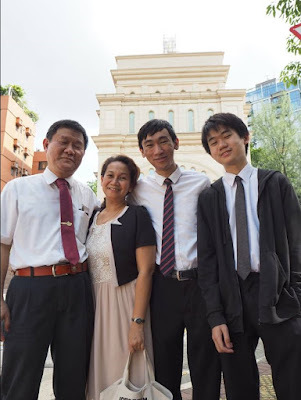 Elder Freddie Chan Yoke Sang of the Seventy, our first Malaysian General Authority of the Church was called to the Lord on 19 October this year. A memorial post of his life of service is shared here. I went back to Kuala Lumpur and from a musical presentation after the District Conference Sunday of 6 Nov 2016, I created this video that attracted over 3.0k views, greater than the last hit from the Mooncake festival home evening night shared above! Click and enjoy! The KL District Choir performed with other groups in an inter-faith event. Anticipation of a busy year in 2017 focused on the bringing forth of exceptional results spiritually but also temporally in my goals of completing my 1st book to be published, I resorted to minimising my journal writings by only embedding my Facebook posts in chronological order in quarterly posts found in my familylane blog starting in the 1st quarter of 2017 with a link to the next quarterly post found at the end of each quarter's post. Extracts of any spiritual event of significance will be extracted from the quarterly reports to be posted on this post. Yes interesting that it is only a week after the Sunday we fasted and on this day there was plenty of food and yet the same verse of 1 Nephi 3:7 rang again in my ears! 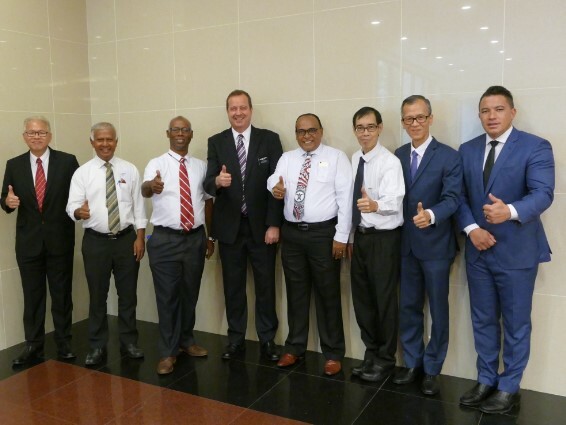 Our branch president Todd Woodford gave his last official talk as the President of KL branch as he is being transferred to Oman for his work, leaving in a couple of weeks time. His example has touched many in the branch as I could feel the spirit which brought me to have teardrops and a few others too I noticed! In his closing testimony, he referred to the scripture at 1 Nephi 3:7 and even tried to quote it with the right meaning but not verbatim as I had done the previous Sunday! 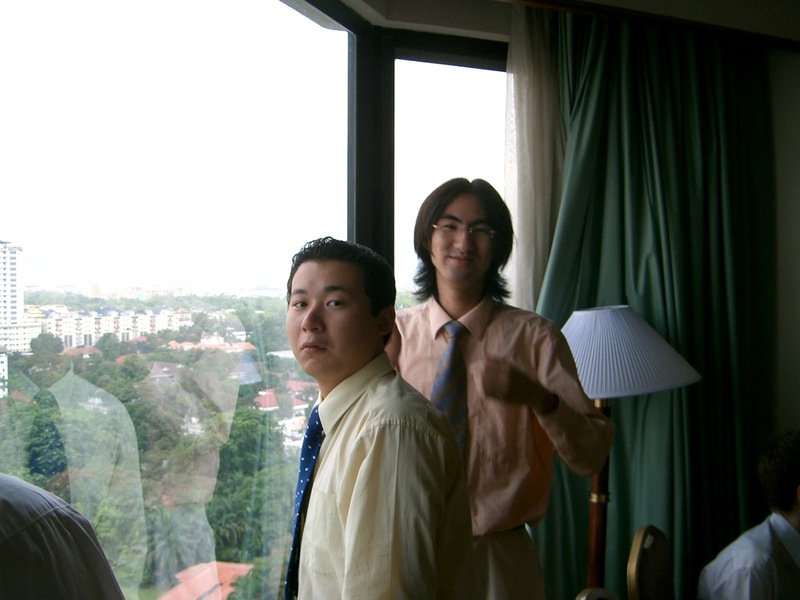 I had to capture this photo with him as I recall that we never had the chance to have a photo together. I asked my housemate to join me too as we both really appreciate this humble servant of the Lord! I noticed that his wife was standing close by and I wanted her to be in the pic as well in remembrance of the day she helped me with booking my airline ticket to the US when her husband and I, at their home sitting on the same table were trying to solve my problem of not able to get my visa card accepted online to book my most important reunion trip ticket to the US in the summer of 2016. She was all quiet as she observed how we both struggled, to try my card first and then her husband's card which also failed, to finally suggest to us to try this other online site and it worked immediately. She then confessed she has been dubbed with the name 'travel agent' by her family members and others who know she does online bookings very often and competently! If you read the link above about this special trip, you would know why I am so appreciative of her and I'm glad I have a photo of both of them with my short narration here in my chronicles that will forever be kept in cyberspace or my Consciousness! It's a spiritual night with a lesson with fun and games every Monday for the Single Adults. Click here for more pics. The arrow is showing Dane who was just baptized on the previous Saturday and is riding high! Interesting that there was a challenge to see who can turn to find the scriptural verse 1 Nephi 3:7 the fastest and the Elder won! I didn't suggest this scripture but the judge did in dark shirt! Tony King did return back to KL on 25 Aug 2018 to share with members and non-members his expertise learned in finding his roots. Click here to jump to that event date. 26 Nov 2017 Gathering the new converts of the past 2 years to mingle with the Branch Council members after church in President Boyd's home. 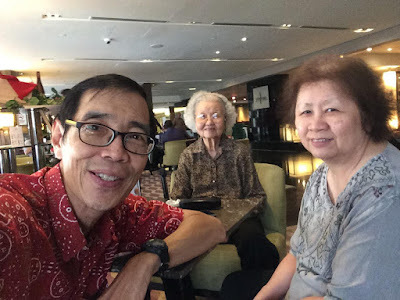 Was nice to meet up with Jackie Ho again, one of the pioneers of KL branch when it started as a group in YMCA KL in the 70s where photos of her and other pioneer members I have today shared in the beginning of this post are from her. She came back for a short visit with her mother from Washington DC area where they live today. David Hatch, now Bishop of his ward in Lindon Utah, with his wife Marianne and children were once in our KL branch over 10 years ago and was on a business trip back that we could catch up again. Felix Yong in the photo was also a new convert to our KL branch in the early 80s and today resides in Petaling Jaya to be under the PJ branch in our same Kuala Lumpur West Malaysia District of the Church. 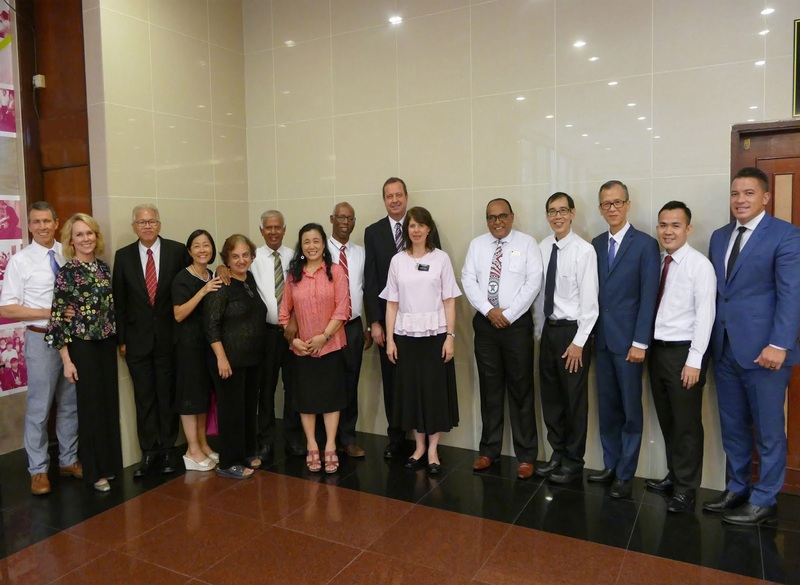 The Mission President and his wife, the Simmons, being their last conference before going home asked us oldies to take a photo with them and the current District leaders of the Church today. 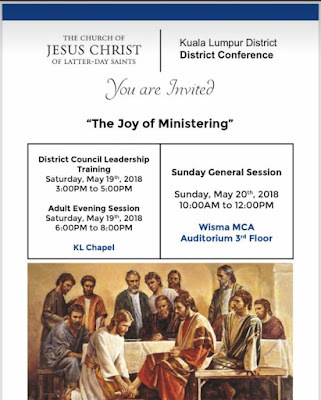 In the weekend conference, we learned all about "The Joy of Ministering." What a coincidence that the President of our Church, Russel M. Nelson, appointed recently in our General Conference, is 93 years old while Tun Dr Mahathir, the latest 7th Prime Minister of Malaysia elected in our recent General Elections, is also turning 93 years old in July! We are all indeed grateful for the ministering services of these two senior men who serve as an example for all of us younger folks! Thumbs up from all of us on that! Reflects how busy I can be in Kuala Lumpur with many activities in one day. The fireside meeting with Barbara Hong at PJ church was special as she published a book entitled, 'Failing Up' which I bought online. Some of the KL branch members were there too. I was asked by the Public Affairs couple to be present to do some media coverage with my camera. 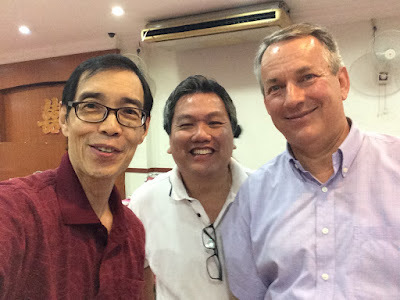 A baptism for me to conduct in the early afternoon and then to rush to the Family History meetings conducted by Tony King, a former expat member in our KL branch who visited KL earlier as recorded above. Cheras branch did find their own new location for their branch. It was about the same time my family gathered in Kuala Lumpur for our family reunion: 8 Dec 2018 On this day the District held a Christmas event, "Journey to Bethlehem" in our KL branch building. 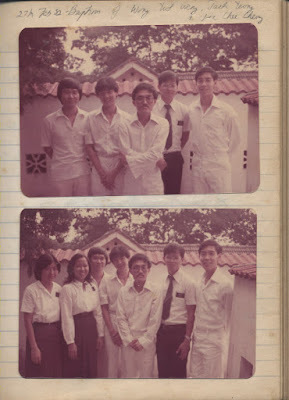 I also had a school reunion on the same day in the night time. There were also protestors against ICERD having a major street protest in the city until 6pm of the same day. It was a busy day for me indeed! A longer video produced by another member with all acting parts and choir singing can be viewed here. Everything turned out well as I exercised my "ShanFu-Consciousness". Now, what is that again? haha... It's an awareness derived from my "maps of meanings" of my own consciousness, that I use to enable an optimal state to occur where "Everything Coming Together" is possible or more likely. I created this term after this year-end experience during my 'Year of the Dog' which actually ends on 24 Feb 2019 according to our Chinese almanac. Yes, I am a Chinese with Western education coupled with Eastern beliefs, myths, and traditions, as explained in the link above on maps of meanings, which is why I appropriately named my own consciousness as "ShanFu-Consciousness" after my Chinese given name Sun Fu but spelled in the traditional Hanyu Pinyin system explained here. Western science teaches about the Conscious, Subconscious and Superconscious(Freud) or simply the Conscious and Unconscious. (Jung) In the East, there are a lot of philosophies and mythologies from ancient China like the 'I Ching' also known as 'Zhou Yi' Chinese classic of changes. There is always balance in Chinese philosophy. The above is a well-known symbol of Chinese philosophy known as the Yinyang which is well explained here. Symbols are like pictures in the sense that it paints a thousand words. 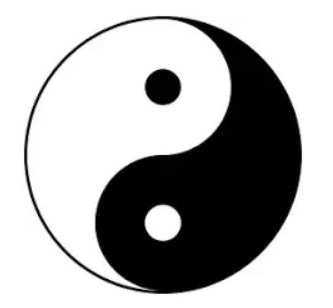 Extracted from the link given that explains about the Yinyang, it reads, "Just as with many other Chinese philosophical notions, the influences of Yinyang are easy to observe, but its conceptual meanings are hard to define." Why is this so? To me, the symbol also depicts our Left and Right brain that represents the Logical and Creative mind respectively. The Logical mind represents Order while the Creative mind is often Chaos where it's hard to find words sometimes to describe what is envisioned. It is this part of the brain that needs mythologies or stories for Man to have a better understanding of the principles or concepts we call fuzzy or non-linear logic where language is inadequate to explain. My early exposure to biology at school including modern math, and computer technology in my university days helps me to appreciate the use of these abstract symbols known as hexagrams today in our modern times. They were used in 'I Ching' by the sages to convey meanings in ancient times that could correspond exactly to the 64 DNA codons in our genetic code and also be used in our modern computer binary codes as well! 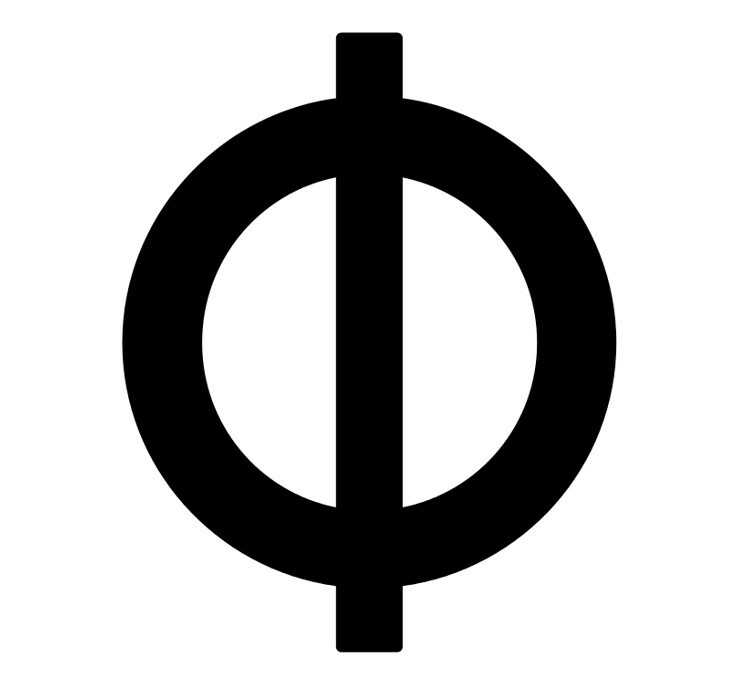 Here is something interesting from the western world of the Greeks with their Phi symbol that looks like the numbers zero and one or computer I & 0 symbols of the binary system put together. 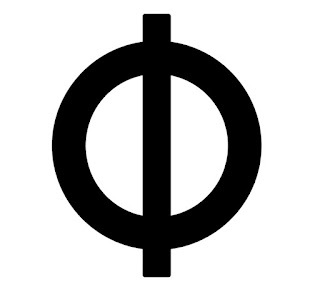 This has become the icon of the Integrated Information Theory that can explain consciousness, the subject I have been researching about for my 1st book project. The week passed by quickly and I had prepared my usual or unusual type of talk presented to Americans, locals and other foreign members where we have at least a dozen countries represented. I described my talk being 'unusual' as I didn't have to write or read my talk from sheets of paper. I just divided my talk to two parts of how I had naturally learned that "Sacrifice brings forth Blessings." First was from my Chinese family where I saw my parents sacrificed much for raising 7 children where I was the youngest. I saw the example of my 4 older brothers who all had to sacrifice and work hard for their own future to become graduates or professionals. I related about one brother who stayed the longest with me in my parents home. 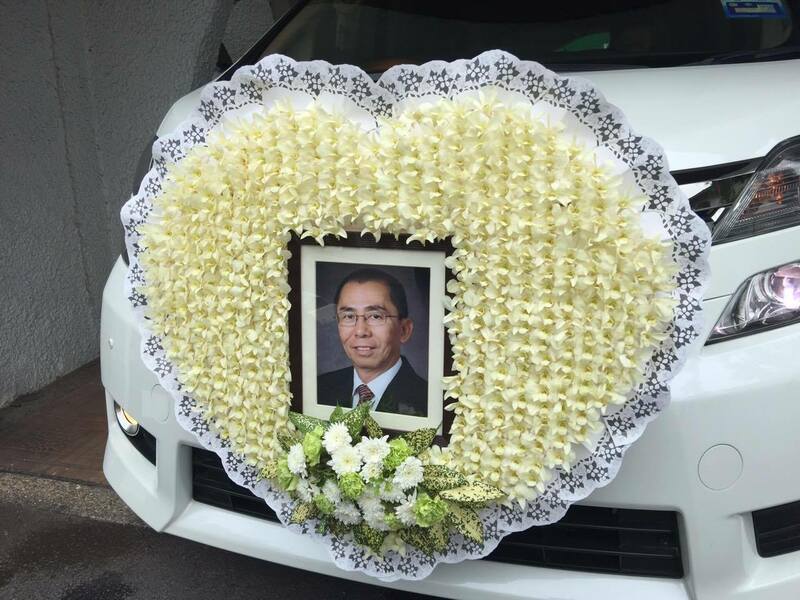 He was exemplary of sacrifice not just in how he worked hard as a medical student at a local university but in his service of planting all kinds of fruit trees in our home garden. He had to dig the ground, prepare the soil, plant the seeds or shoots, water them and continue nurturing the plants, pruning them as they grow larger to eventually harvest the fruit of his labors, Through his sacrifice, our family got to enjoy the blessings of eating a variety of local fruit from our garden. Later I learned sacrifice from our Church when I became a member in the final year of my tertiary education in Australia. The greatest sacrifice I learned was the atonement of Jesus Christ and his example during his ministry. I also learned of the sacrifice of the members of the Church without a paid-ministry to see the blessings they enjoyed as they rendered hours of service each week to serve others. I was particularly impressed by the full-time missionary Elders who taught me the Gospel and the restoration of the Savior's Church and teachings. I learned there were tens of thousands of them each year called to serve 2 years in an assigned country sponsored by themselves or their families. Little did I know then that I would receive personal revelation later to served back in my home country. 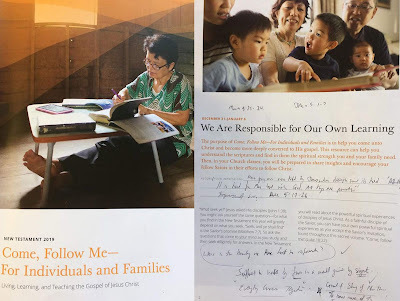 Miracle after miracle of personal revelation occurred where I am glad that the Church taught its members to keep journals as this journal post is my record of how it all began and carried on to this point in time where this post is being written. So the talk was easy for me to prepare as the truth that 'Sacrifice brings forth Blessings' was something I had learned since young and was well embedded in my consciousness as well as my personal journals. However as I thought about the conclusion for my talk, I felt impressed to share why I enjoyed missionary work which was the focus of my last calling. I sat down the night before to very quickly be able to write down these 7 points that I would have to read out for the conclusion of my talk the next morning. I simply asked myself the question how was it that I could communicate with reason to anyone to build a relationship of trust with them as a member missionary? The following lines flowed out easily as they were actually in my consciousness and also in my long written journals where I will link each point to the relevant journal as a reference point. (These links could not be shown in my talk and serve as an elaboration in this journal only.) 1) I can reason with an educated man as I'm an educated man more subtly known as "Mr. OPT" (Optimal Performance Thinking) 2) I can reason with a businessman as I am a businessman more subtly known as a "Serial Entrepreneur." 3) I can reason with a spiritual man as I am a spiritual man more subtly known as a "Disciple of Jesus Christ." 4) I can reason with a family man as I am a family man subtly known as "Dad the KL City Kid" 5) I can reason with a politician as I am a politician subtly known as "Mr. TalkLane" 6) I can reason with a woman as I am a woman subtly known as "Mr.Mom" after my wife passed away. 7) I can reason with God as I am God with the small "g" subtly known as "A Child of God"
Yes, I knew all my life that Sacrifice does bring forth Blessings that provided me all I needed in life and even more! The greatest blessings I felt was how my Awareness or Consciousness increased the more I served others to understand so many things whether on earth or in heaven. The physical, the psychological and the spiritual truths were all manifested to me which I did my best to record in my years of journals with as much detail as possible, lest I may forget myself over time due to old age or sickness. 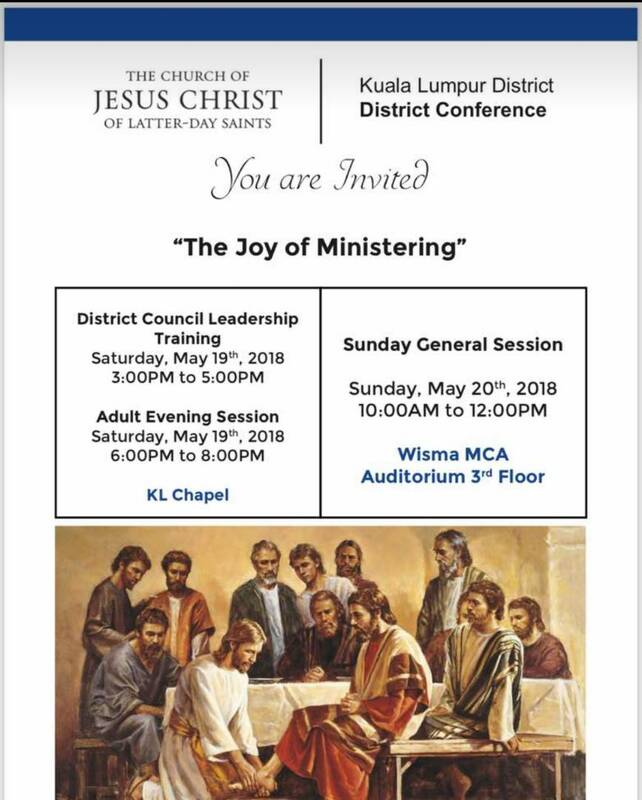 1st fast Sunday of the year, 1st day to implement the new 2-hour only Sunday program of the Church worldwide and another day of occurrences showing again, "Everything managed to come together"! 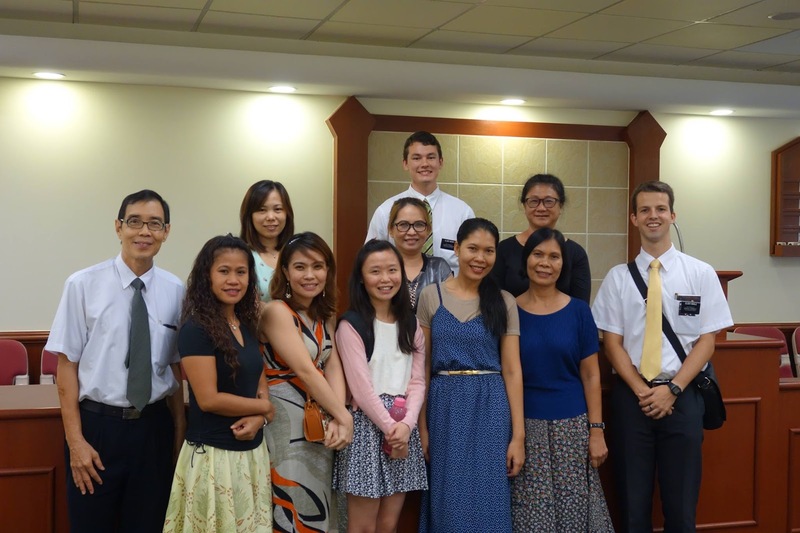 It was a full house at 10am in the KL branch sacrament meeting hall. At the front sitting down was the branch Presidency and some presiding visitors, firstly the Mission President and District President, President Rowley and President Tolman respectively. I went up to be the first after the sacrament was over to bear my testimony after the person conducting had finished sharing his testimony to invite anyone else in the congregation to share. This would be my routine as after 30secs when no one has walked up to the pulpit yet, I felt I could use up the time to bear my testimony first instead of letting more pause time go by which is usually the case. I shared not only my testimony but expressed that I would embark to leave the city to the east coast for a season to complete the important task of finishing the writing of my book. I also expressed that my recent release as the Branch Mission Leader was timely as it will help me to feel less guilty to be away from KL for a season of time to complete my book. At the time of video of 1:54 is when Jesus states how difficult it is to enter the Kingdom of Heaven and when the disciple asked who then can one be saved, listen to what Christ responds. He is basically explaining that with Man this is not possible but with God all things are possible. At the time of video of 1:25 is when Christ asked is it easier to say 'thy sins are forgiven thee or arise and take up thy bed and walk', listen to what Christ responds. He is basically explaining that the Son of Man has the power to forgive sins. From the 1st lesson from the Come Follow Me manual, I received the spirit to understand what the scriptures meant and the video helped me visualize that in both situations, Christ was teaching with authority knowing he was the One who had the power to forgive sins which was even greater than the power to heal as shared in the 2nd video. In the 1st video, Christ said what was impossible for Man to be saved said with God all things are possible. I could feel Christ talking with authority as no one knew at that time that Christ was that Savior or God who would carry out the atoning sacrifice that would take place in the Garden of Gethsemane. This atonement is not understood by many so I've been guided by the Spirit to share another long post with a video and scriptural links to help any reader understand why The Church of Jesus Christ of Latter-day Saints has living prophets today. This is to prepare the world for the Second Coming of Jesus Christ with thousands of missionaries sent out each year so all the people no matter what country they are in can learn of the Saviour from the missionaries or online. There are signs and prophecies being fulfilled on earth shared in the holy scriptures of his Second Coming. One can click here to be enlightened about the Atonement and why it is so necessary. After the 2 hour Church service, President Tolman from the KL West Malaysia District said he wanted to have some time with me in the room of the branch president. He informed me that he was issuing a call to me that came from the Area office on behalf of Elder Woo, the area Seventy from Singapore. 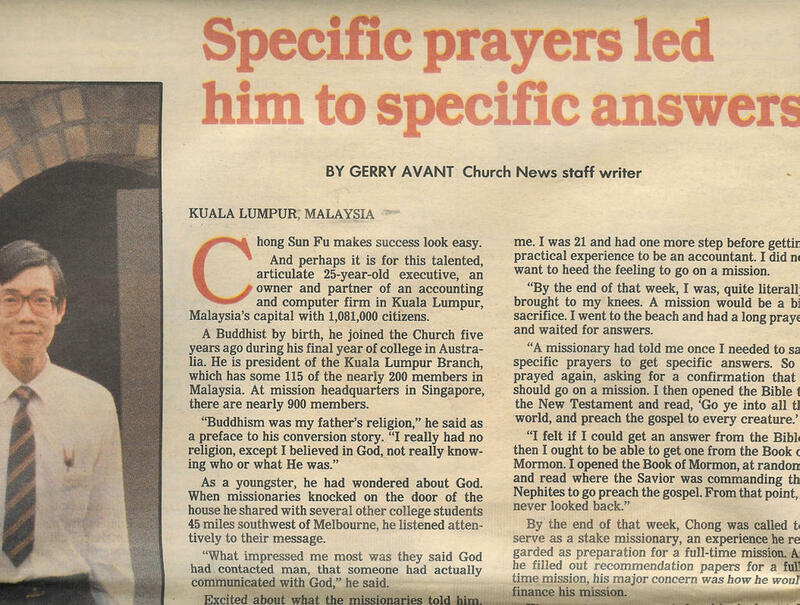 I was asked if I can accept the calling to be the Malaysia editor for the Liahona magazine. 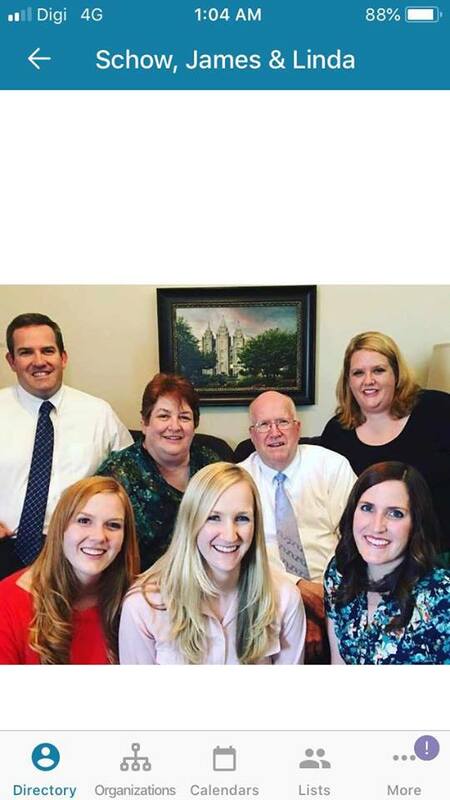 I responded that I will accept as I have never rejected a calling before and made the comment that I did share in my testimony earlier in the morning that being released as the Branch Mission Leader made me feel less guilty as I was heading to the east coast to focus on finishing my book. President Tolman further commented that it seemed a calling that I can perform anywhere so long as I had access to the internet so it would be perfect! Yes, I mentioned to him that everything seems to be coming together for me and he set me apart for my new calling. Serendipity or Synchronicity seems to occur often in my lifetime and I must continue to share surprises I have been receiving recently that fits this theme of "Everything Coming Together" found here. greeting from bob and wendy grant from geelong .good to see you still keep the faith.i remember your last visit a couple of years ago.